Come raise a glass to ten years of groundbreaking theatre in Charm City! The Carrots are starting this tenth anniversary season with a night of food, drinks, and karaoke: and you’re invited! 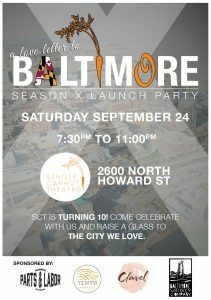 Enjoy food from Parts & Labor and drinks from Tenth Harvest and the Baltimore Whiskey Company. Dance the night away with DJ Hella Freckles, or take the stage for karaoke with KJ JK of the Crown. Enjoy displays from local artists, including Greg Otto and selections from Federal Hill’s Crystal Moll Gallery, and share your favorite memories of Baltimore and SCT in our video testimonial booth! $25 General Admission – Join the party and enjoy a free drink ticket! $45 Premium Admission – Enjoy free drinks until 9:30, line-skipping privileges at karaoke, and other perks!